Don't look now, but here comes the newest version of Firefox. Today, Mozilla launched Firefox 4 Beta, which introduces a new look and a sizable pile of new features. 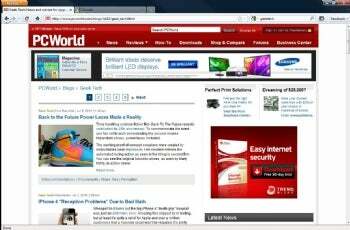 With Firefox 4 Beta, Mozilla introduces a brand new interface. It takes cues from Google Chrome and other browsers by placing the tabs on top by default (in Windows only; it'll come to Mac OS and Linux later on), and hiding the menubar (instead, a new Firefox button provides access to commonly used commands). Like other new browsers, Firefox 4 Beta provides some crash protection features: If a browser plugin crashes, it'll just bring down the plugin instead of causing the entire browser to crash. Firefox 4 Beta also features bolstered HTML5 support, adds full WebGL support for 3D rendering within the browser (though it's disabled by default at this time), and adds support for Google's new WebM video format. Feeling daring? Visit the Firefox 4 Beta 1 download page and check it out. And if you've already taken Firefox 4 Beta for a spin, share your thoughts and post a comment.